A day out in Denver doesn’t have to break the bank. There are a number of ways to get your fill of art and culture without spending any money at all (well, minus a little for gas or public transportation). Here are TAVA Waters’ suggestions for a (relatively) cost-free day of big fun in the Mile High City. Entering its 22nd season, the Cherry Creek Fresh Market is the largest farmers market in Denver. See what Colorado growers, food vendors, and artisans have to offer up. Chef events, gardening tips, and live music are also part of the festivities. Check it out at Cherry Creek Shopping Center from 8 AM to 1 PM on Saturdays starting May 4 and on Wednesdays from 9 AM to 1 PM starting June 12. Beware, though! With so many great vendors, you might not be able to resist parting with a few dollars. OK, so maybe you broke the rules and spent a little money at the farmers market. Or maybe you just packed your lunch. Why not bring your fare to the park for a relaxing picnic? 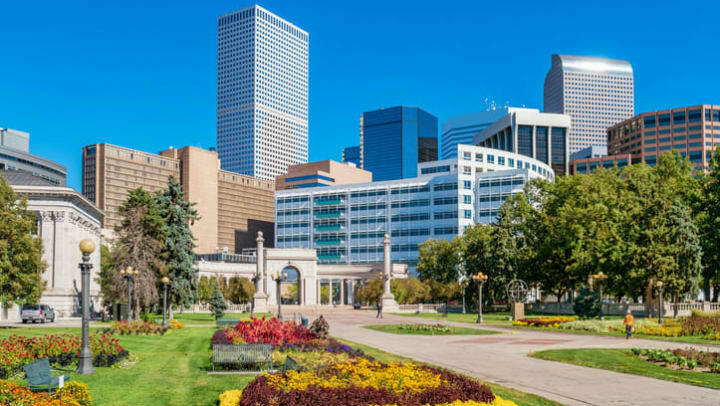 A neighbor to the State Capitol, the Denver Art Museum and many more attractions, Civic Center Park is a gem in the heart of the city. With the Denver skyline in view and more than 25,000 square feet of flower beds, there’s no better backdrop to fuel up for your next free adventure. Learn all about money without spending a cent at the United States Mint in Denver. Best of all, it’s right around the corner from Civic Center Park. Go behind the scenes and find out how the Denver Mint churns out billions of coins each year. Check out one of the six free daily tours held Monday through Thursday. Tickets are distributed on the day of on a first-come, first-served basis at the tour’s information window, which opens at 7 AM and is located between West Colfax and West 14th avenues. Get the full scoop on tickets and times here. Cap off your day by exploring some of Denver’s best art galleries, museums, gardens, and more – all for free. With a little strategic planning, you can get your fill of culture at no cost. You just have to know when to go. Many area museums and galleries offer free days. So plan your day of $0 fun around one and enjoy! The Denver Art Museum, the Colorado Railroad Museum, and the Clyfford Still Museum are a few options with upcoming free days. Mile High on the Cheap put together a handy list. Check it out and start planning today. Looking for more fun things to do near your TAVA Waters apartment? Check out the TAVA Waters blog!